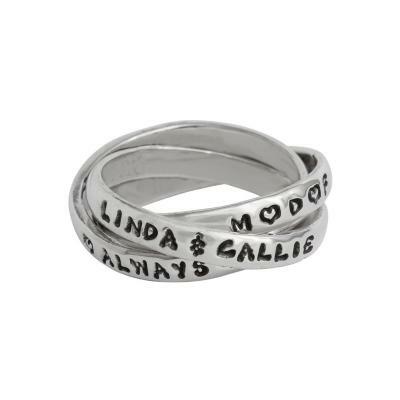 "Mother Daughter Ring Silver, Hand-Stamped Triple"
Mother Daughter rings are a symbol of the love a mother and daughter share. Our unique Mother Daughter ring intertwines to further symbolize the connection which will last forever. The bond between a Mother and Daughter can never be broken. Mother Daughter rings are a symbol of a special relationship ~ the intertwining bands can be stamped with names or words that describe your bond.